Rey Campero Espadín is made by Rómulo Sánchez Parada in Candeleria Yegloe south of Oaxaca. This tiny village of 150 people boasts two great Mezcal brands, Rey Campero and Vago, many more are made in the region so population definitely does not correlate to the number, variety or quality of Mezcal. Rómulo learned to make Mezcal from his father and grandfather but the family history in the business goes back to his great grandmother, Clara Manzano Rios who build the family’s palenque in 1870 and started distilling with her husband Nicolas Sanchez. It was the first palenque built in Candelaria Yegolé. Flash forward more than a century, Rómulo was primed to start distilling but the economy was so bad in Oaxaca that he only got this brand started in 2012. Now that there is a wider appreciation for Mezcal we can enjoy the fruits of Rómulo’s labor. Rey Campero is imported to the U.S. by Mezcal savant William Scanlan who runs the awesomely named Heavy Metl Imports. He selected this Espadín for the reasons we love it, because it is a full expression of the land where the agave are grown and of Rómulo’s sensibility. 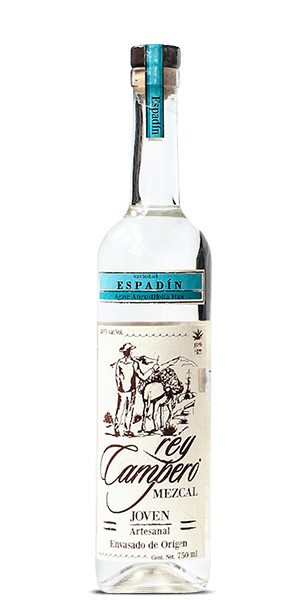 What does Rey Campero Espadin taste like? The Flavor Spiral™ shows the most common flavors that you'll taste in Rey Campero Espadin and gives you a chance to have a taste of it before actually tasting it. Orange peel, marshmallow, hoja santa. Smokey and smooth. Super yummy. If you enjoy the delicate essence of nail polish remover, this is the mezcal for you. Not sure if I got a bad batch or what but this mezcal is straight up nasty. When I visit Mexico I drink cheap local mezcal and really enjoy its nuance, but in this case I had to pour it out. Thinking / hoping there is some mistake or tasteless joke based on the mediocre reviews this has. Anyway, if you need a strong bar cleaner or just want to grow chest hair, give this mezcal a try! It is a classic, delicate, Mezcal with a soft nose, light body that leads to a short & rich finish. Pleasant to sip, balanced smokiness and gentle flavors. It was my first taste of mescal. It takes bit to get used to the smokiness - but I liked it. the after tones are exquisite and not so overpowewring as to take them away! she's a real individual mescal. on the rocks she dominates the night and she compliments the oily citrus notes from the limes! Hideous stuff. Paint thinner would be better, it just wouldn't have a smoky finish. My first Mezcal. I have nothing to compare this dram with. Being a single malt scotch, bourbon, and rhy drinker never prepared me for the wild taste and finish. Not sure if I like it but really glad to have tried it. It's got a bite but tasty. My first time with Mezcal. a sharp, flinty sort of taste with a gentle kick. I liked this the best out of the Mezcal tasting box I received for sure. I think its under rated.